Children say the funniest things, yet all too often, I seem to forget them after a day or two. I’ll start telling my husband.. “C said the funniest thing…” and then I can’t quite remember. Or I get it a little mixed up and it’s not nearly as funny as I remember. So I started writing down the funnier moments of the day. 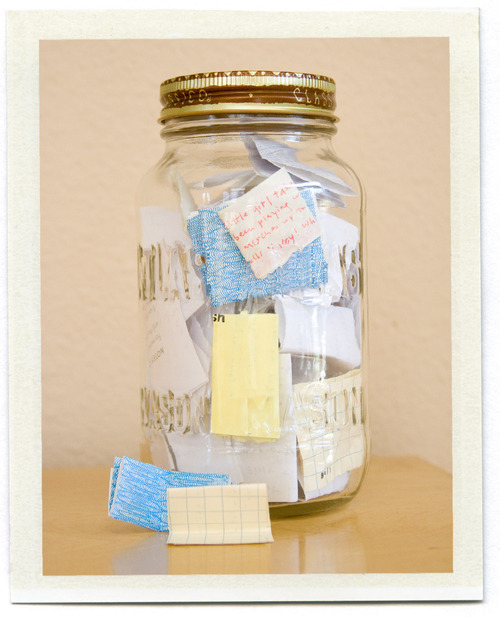 I keep a jar on my desk, and when the kids say something particularly worthy of recording, I grab a scrap of paper (phone bill, envelope, chopstick holder.. whatever is lying around) and I quickly jot it down. I read about Joan Didion doing something similar when her daughter was a young girl in The Year of Magical Thinking. Ron Huxley Reply: Children life in the the magical world of imagination and mystery. Use this to your advantage as a parent and start to collect little memories of times together. Leave messages for your child at night when they go to sleep and let them reply. Keep the conversations for the tougher days ahead. By Ron Huxley LMFT in Uncategorized on February 1, 2012 . Wonderful idea, I wished I’d have done something like that when my kids were little. Ron Huxley is available as workshop or Keynote Speaker. Contact him by checking out the "about" page details.